I am doing this on another forum but thought it was a great idea so I would start a thread for it here. I will paste in my blog post daily. Chest (under breasts) - 35"
Day Two - How tall are you? Do you like your height? How tall are you? Do you like your height? I am 5'10" tall. To me that feels pretty tall for a woman. I work with quite a few women and I think I am the tallest. Do I like it? Ummmm...yes & no. I like being able to carry myself with pride but I also feel so much bigger than other women. This leads to me being insecure about my size even more. I feel like I am broader than most women so that I will always be 'bigger' even if I wear the same size clothing as they do. I like this idea. For day 1 does one have to post inches? You can do it however you would like. There are no rules. Whatever the question means to you at the time is what is important. I am viewing it as a way to possibly explore my own self further than I usually do. I looked and looked at pictures on google and came back to Jillian. She is not everyone's cup of tea for a trainer but she works for me. I like her tough personality. She is not overly muscled or extremely thin either. I admire that. She could easily do too much and not look like she does now. I do not aspire to be skinny. I want to be fit & healthy. During my searching for a picture online I googled the word THINSPIRATION. I came across photos of girls who looked on the verge of death from being so thin. I also came across pro-anorexia websites. I actually spent time reading one with 14 rules of how to become anorexic. I couldn't believe what I was reading. I just really hope to keep my goals in mind and never go overboard like that. That is why my thinspiration is more a vision of strength and fitness than someone who is simply skinny or thin. April-this sounds like a really great idea for all kinds of reasons. I love reading your posts and will look forward to looking in daily to see how youre doing. Sending lots of positive thoughts your way. Your weight losses so far are fantastic! 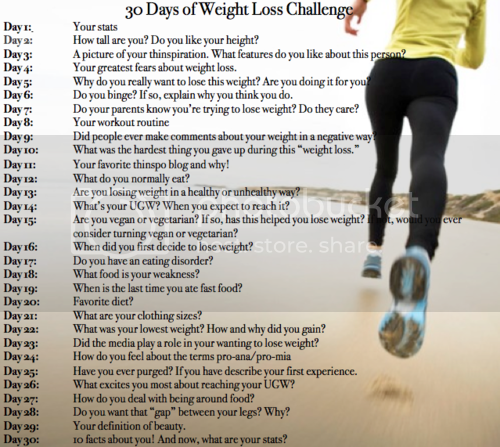 I like this idea, its a really good way to help with the psychological aspect of weight loss. I'm 5'7. My height has never been an issue for me, I suppose I was always tall until I was in my early teens and then everyone else caught up with me and then I was average. I have quite a few female friends who are small and very petite and I find myself thinking "little and large" whenever I'm with them, but other than that I like my height! I'm loving this idea, I think it's great. I'm going to try my very best to answer all the questions listed, I'm just finding some harder than others to really be honest with myself about...which is a good thing! Right im going to join in with this- i need some focus!!!!!! My measurements and body fat, body water, muscle mass has been done 6 weeks ago at my first bootcamp as part of my weight loss group. I will get results of them on 1st September so will post them and get up to date with them at a later time.